Mrs. Crimble’s Large Choc Macaroons. It’s enough to make a guy wish macaroons were named something else entirely. Coconut bumps, maybe? Anything to stop the confusion between these very different sweets. These Ms. Crimble’s Large Choc Macaroons caught my eye at the local Planet Organic because they seemed an odd thing to find at a Planet Organic. Was there some kind of awful healthy catch? A bait and switch? Because the nutritional info panel made me think they belong in a convenience store, not a health-oriented grocery shop. The Pitch: “6 macaroons with chocolate flavour coating.” Wait, what? “Chocolate flavour”? I don’t like the sound of that. I guess that explains the “Large choc macaroons” label on the package. Also: “Deliciously gluten free.” There’s not much information on the packaging. The Look: Very basic. Clear plastic wraps a half-box of cardboard that contains six toasted, flattened coconut lumps dipped in (and striped with) chocolate flavoured coating. The coating gets messy on the clear plastic, smearing itself all over the top. It doesn’t look great, though it clearly displays what you’re buying without resorting to a beyond-photo-perfect illustration. Cute logo, too. The Taste: That soft yet scratchy shredded coconut texture. Sweet, yet missing something; too one-dimensionally cloying without anything to play off of the sugar. Kind of bland and chalky; a bit stale-tasting, even though the best-before date is four months away. A bit of salt would probably help, as would some decent chocolate. 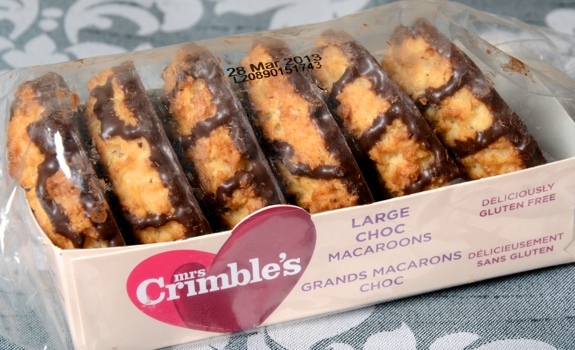 I quite like the Mrs. Crimble’s logo: oven mitt meets heart. Cost: $3.99 for a 220-gram six-pack of macaroons at Planet Organic. Availability: Planet Organic. No idea where else. Can’t be widespread in Canada. Nutrition? 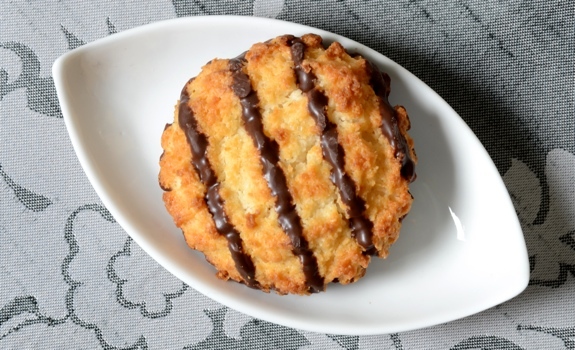 : Per macaroon (36.8 grams): 173 calories, 8.4 grams of fat, 10 mg of sodium, 1.7 grams of fibre, 1.2 grams of protein. The verdict: Not bad, but I can think of better ways to blow 173 calories.